Both soups were yummy, and I have more Scotch Broth in the freezer. Today, DD and I had tuna fish salad sandwiches. My next cooking project will be meatloaf patties. Cook as needed!I think my solution to cooking for one, is don't. Just cook as usual and package for one. Some things can be cooked to a certain point, put aside, and finished when ready to eat. I'm getting used to my new computer room, across the hall from my bedroom. It was handy when I woke up the other night and couldn't get back to sleep. Things like the printer don't work like they used to, but they work. The family computer gurus will be in again soon, to do more work like replacing cables with new ones. I'm getting used to my new iPhone. Did I say that my last phone drowned? There have been some problems with installing e-mail and with my contact list, but they seem to be straightened out now. It helps to have family with iPhone knowledge. I find it interesting that my Bluetooth now has customized ring tomes, so I know who is calling. That is a new to me feature. I lost my weight/food tracking program when I lost my phone, so went with My Fitness Pal on the recommendation of my daughters. The phone version has a bar code reader, which may come in handy. Since Easter, I have been losing weight by eating smaller portions and exercising more. Tracking shows me progress and helps with nutrition. Knitting progress - I have a few photos. 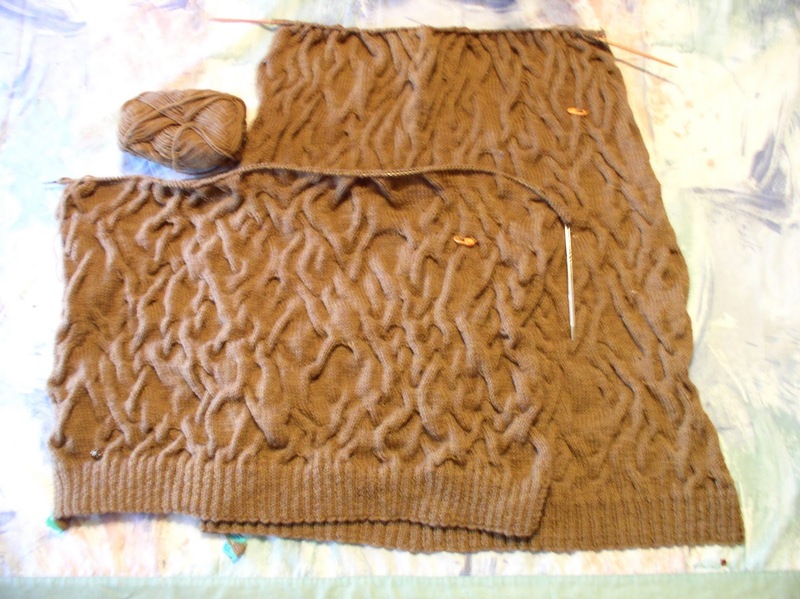 The tree bark sweater progresses. I hope I have enough yarn. If not, I'll knit it again on larger needles. I might be able to make it smaller too. 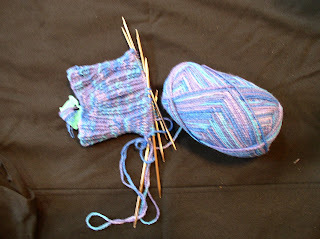 I have a secret project I call a nose warmer for an elephant. 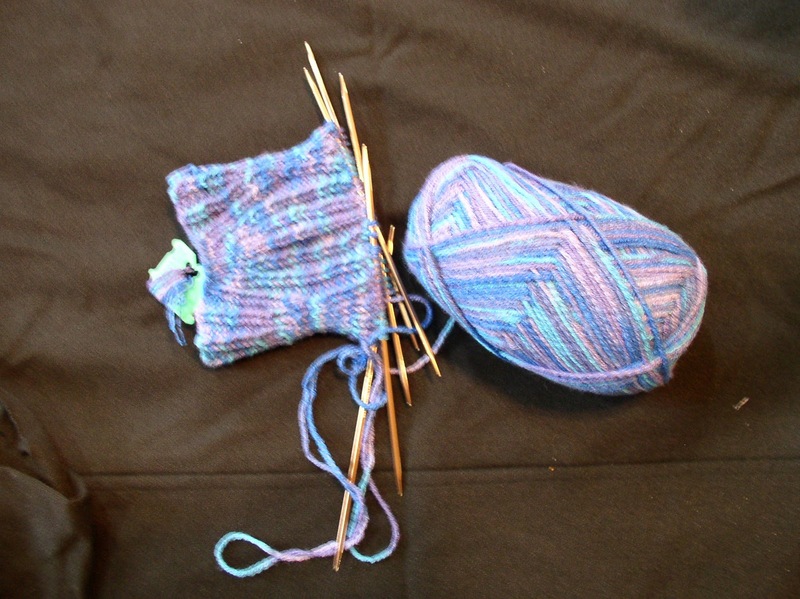 It is my purse knitting, being a stockinette tube, just knit round and round. These socks are from Crystal Yarn Palace Panda Cotton. The pattern is called Hypnosis by Janel Laidman. I also have a pair of men's socks in Burgundy, but not much progress yet.